Hi gang. Big ups to those of you who tuned in last night, I hope you enjoyed the funk! Alrighty, Hubie Sounds will be back in a few week’s time, check back here for updates! Al began DJing in 2002 and co-presented a show on NSB Radio for 3 years under “The Deckwreckers” guise, before Nelson brought his brand of hip-hop, funk and nuskool breaks to the table, joining forces with Al just over 3 years ago. The pair went on to win the “Battle of the DJs” DJ competiton hosted by the Funky End Bar in Aldershot later that year, which resulted in the launch of monthly residency ‘Fractured Funk’ which is now into its 4th year and still going strong. Their vibe is very much on a breaks tip: expect big synths, and chunky basslines – but they’re also partial to nu-funk and some electro business depending on when/where…. Gig highlights have included appearances at Ministry of Sound, Slinky – The Opera House, Herbal, and The Double X Festival in Slovakia, plus regular appearances on the dance stage at Guilfest Fesitval in the past 3 years. During this time sharing the line up with DJs such as The Freestylers, Krafty Kuts, Atomic Hooligan, A-Skillz and Pendulum. 2010 has been going very well so far for the lads. Of late they’ve been teaming up with the Thump crew who are a great bunch of lads really pushing the breaks thing locally. Al & Neil’s night seems to be on the up too – running a breaks night outside london has always been a massive challenge but a bit of careful education seems to be finally paying off 😉 Lots of dates to look forward to this summer. And of course we will also be spinning plenty of fresh new tuna, including new material by The Chemical Brothers, The Rogue Element, Nick Thayer, Deekline & Tim Healey, 2 Bit Thugs and much more! 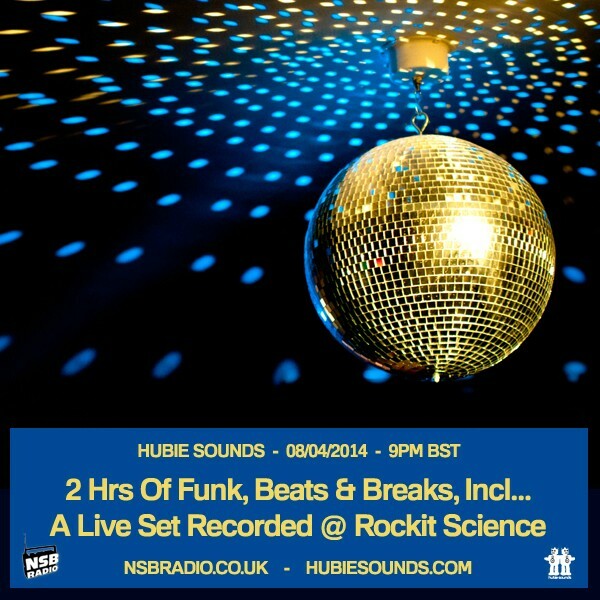 Make sure you check out Hubie Sounds, this Tuesday 11th May @ 9pm UK time – live & direct on NSB Radio!